MOSCOW (AP) Germany is trying to look united ahead of its World Cup opener after a photo put the team at the center of a national debate over culture and identity. Politicians from the far-right AfD party questioned the players’ commitment to Germany, and Gundogan was jeered by some fans during last week’s friendly win over Saudi Arabia. Ahead of Germany’s opening Group F game against Mexico on Friday, midfielder Julian Draxler defended his teammates. No team has successfully defended the World Cup title since Brazil in 1962, and Germany coach Joachim Loew isn’t playing down the difficulty of his team’s task. ”It’s the most difficult feat, but the hunger and the ambition are definitely there,” Loew said, adding that France, Spain, Brazil and England are all stronger than in 2014. Loew was also eager to dispel any remaining doubts over the fitness of Manuel Neuer, who missed almost all of the club season with a fracture in his left foot. 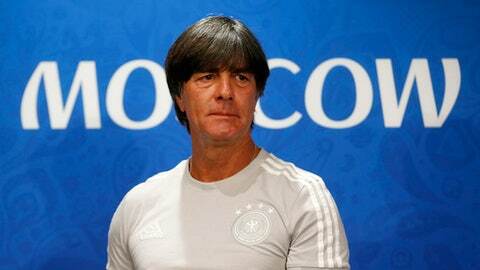 Ahead of Sunday’s game against Mexico, Loew said Germany spent Friday concentrating on corners, free kicks and penalties to deal with a perception that set-pieces might be a weak point for the 2014 champions. The team is a fusion of those who won the World Cup in 2014 – 10 players remain from that squad – and the young guns who lifted the Confederations Cup in Russia last year, beating Mexico 4-1 along the way.